The pop stylings of The Beets, crafted in a lo-fi environment though they are, are in the driver's seat with this Jackson Heights band's second full-length, Stay Home. It's messy, it’s a bit malformed, and sometimes it’s just out of tune, but throughout this lo-fi outing, The Beets prove their pop ability. Sure, Stay Home may sound like it could have been recorded by gorillas with a modicum of mic-placement knowledge (gorillas don't come built with that sort of thing, but I assume if you can teach one sign language, you could teach one to put mics around a room and hit a 'record' button,) but that reading of the album overlooks its non-incidental attributes. 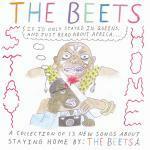 Stay Home is noisy, but that's not really a musical feature of The Beets — it's part of their recording style, and certainly, their live performances are noisy and sloppy, but it's not the most important factor to consider when you're examining their musical output. No, more important is the band's grasp on structure and style — and they've got plenty of that on show, even if getting to it is, well, a bit of a chore sometimes. Stay Home indicates that the first release from The Beets, Spit in the Face of People Who Don't Want To Be Cool, wasn't just a fluke lo-fi hit by a band who actually couldn't pass muster. Yes, the vocals are still slopped about and the guitars have come off their hinges a bit — it's clearly the same band in the same environment, and they've not tried to fix that too much — but that engaged songwriting is still there, too, and that's what really made The Beets worth a damn in the first place. They've even managed to clean up that recorded-underwater sound that made Spit in the Face stand out — yeah, it's still noisy, but it's a bit easier to handle. This isn't for everyone, and it's not for every occasion. As you might expect from their first release, which had its fair share of nice pop moments, there are some moderately stand-out tracks (Dead comes to mind, as do Watching T.V., and Cold Lips for their committed approaches and principled steadfastness) that make a full listen really worth it. Sure, that lack of sonic fidelity may be patience-trying, but meting out a few tracks at a time does a world of good in listening if you can't stand the mess for all 30 minutes of album. Just having a chance to let a portion of the album digest before returning to the next few tracks may be good enough for some people rather than jumping headlong into it, but others may simply find enjoying Stay Home an uphill battle. This isn't for any old pop fan, and it's probably not even for every lo-fi pop fan, but it resonates with its core with spectacular verve. Stay Home, more from The Beets in the vein of their first release, isn't necessarily more refined so much as ever so slightly cleaner, and it doesn't really need to be to connect with its audience. The Beets just need to keep their genuine approach alive, and they ought not not have a problem maintaining that base. With Stay Home we not only get that genuine approach, but we get songwriting that's been notched up a bit. That alone is worth the cost of admission: The Beets are clearly good songwriters, even if they do happen to get their feet a bit muddy when they stray off the well-beaten path.